Dr. Kate graduated from Northwestern College of Chiropractic (NWCC) in 1992. In 1994, she earned her certification in Sports Injuries (CCSP). In 1995, she completed her Bachelors of Science Degree in Human Biology from NWCC. Following graduation, Dr. Knafla continued working at the college as a clinician and an assistant professor. In 1995, she purchased a clinic in Princeton, MN and Knafla Chiropractic Clinic was established. Dr. Kate enjoys treating families from a newborn to your grandparents. Dr. Kate has a passion for sports injuries. Dr. Kate is an athlete herself and enjoys waterskiing in the summer. She competes at the state, regional and national level. Being an athlete, Dr. Kate understands the injuries (being injured herself) and the drive to get back into the sport along with the importance of maintaining peak performance for the sport. Dr. Kate also focuses on nutrition and teaching the importance of good nutrition in regaining and maintaining optimal health, not only for the athlete, but for the non-athlete. Dr. Kate's interests include spending time with her family, Tobi (her dog) and friends, hiking, crafts, biking, gardening, reading and water-skiing. Cathy has worked in the health care field since 2010 and has been with Knafla Chiropractic Clinic since 2016. She enjoyed visiting with the patients and loves her job which includes playing with Tobi, the Office Dog. Outside of the office she enjoys being with her family, church activities, gardening and crafts. She also has a passion for animals. Tobi has been with the clinic since 2015 and her job is to greet patients at the door. She plays with the kids and adults and helps to calm them down before their adjustment. If Tobi isn't at the office on a given day, she is missed by everyone. Tobi's care for the patient is just as important as Dr. Kate's care. Rachael grew up in Princeton and has been a massage therapist since 2011. She received her diploma as a certified massage therapist from Minnesota School of Business with 1,066 hours of hands on training. 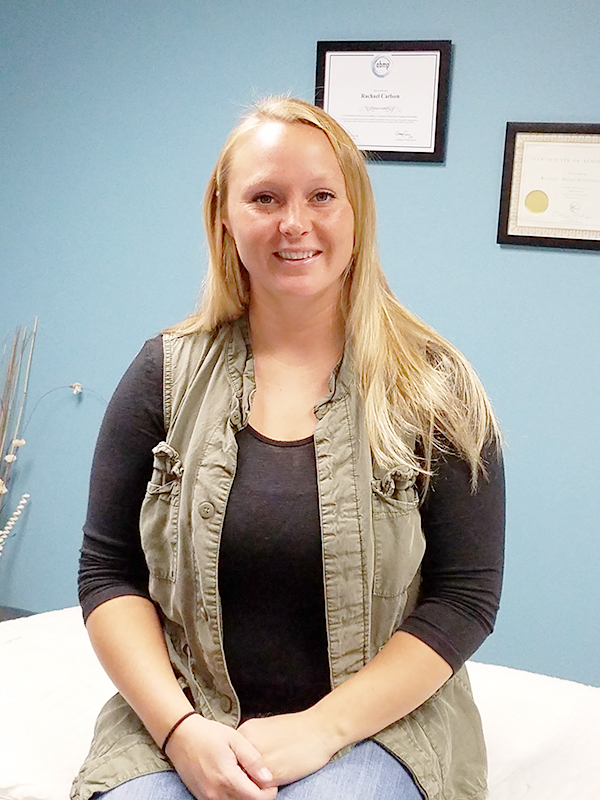 She has been with Knafla Chiropractic Clinic since 2013. She is skilled in Swedish Massage, Deep Tissue, Sports Massage, Myofascial Release, Pregnancy Massage and Reflexology. Aside from being a therapist, she has 3 furry kids: a husky, a puggle and a cat. They keep her very busy along with her husband and two children. Call 763-742-7957 to schedule an appointment with Rachael. Mary is a US Army Veteran and a breast cancer survivor. She has a Bachelor's degree in Human Physiology. She graduated from Minnesota School of Business in 2016 with a diploma as a certified massage therapist. She passed testing and is a Licensed Massage Therapist. She started with Knafla Chiropractic Clinic in February 2017. Her business Have Table Will Travel can also bring her expertise to your home besides being seen at the clinic. She is skilled in Deep Tissue, Sports Massage, Hot Stone and Swedish Massage. Aside from being a massage therapist she enjoys volunteering and being outdoors. Call 763-479-9884 to schedule an appointment with Mary.